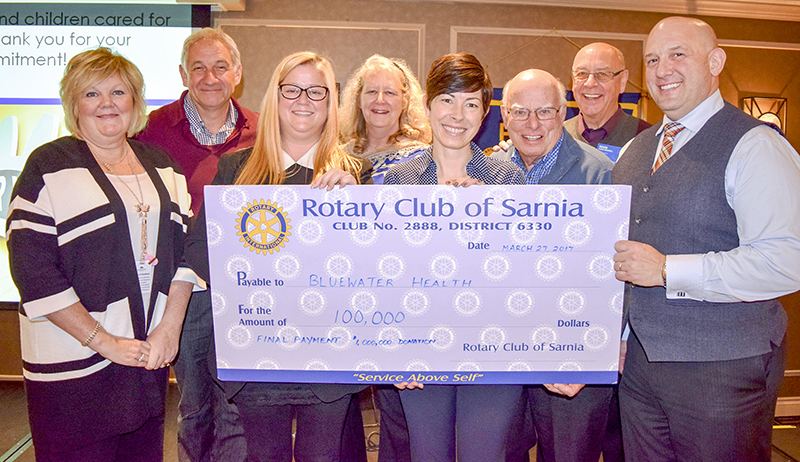 The Rotary Club of Sarnia has raised nearly $300 a day for Bluewater Health, every day, seven days a week for the past 10 years. That amounts to a staggering $1 million that’s been used to build a maternal and child program with new labour, birth, recovery and post-partum facilities. “This is truly a transformational gift for our hospital,” said spokesperson Kathy Alexander, as she collected the final installment of $100,000 at a recent Rotary luncheon. “Your donation has a tremendous impact and will continue to have a tremendous impact for years to come,” she said. The club’s money was used for “bricks and mortar” and also to buy equipment and technology such as infant warmers and stretchers. The department upgrades have helped attract anesthesiologists able to offer epidurals for the first time. Improved facilities and the availability of epidurals are likely why more moms are choosing to have their babies at Bluewater Health, said Alexander. About 1,000 births and a record number of twin births occurred at the Sarnia hospital last year. And more fragile newborns could be treated at Bluewater Health rather than transported to London hospital. It’s believed the Rotary Club of Sarnia’s $1 million donation is the largest contribution to any Ontario hospital from a service club, said Alexander, the executive director of the Bluewater Health Foundation. “Fulfilling your $1 million commitment calls for a huge celebration,” she told the membership. When construction started on the new hospital in 2007 pledged to write a $100,000 cheque every year for a decade. That’s a lot of money for any philanthropic group, particularly when membership is shrinking. The Sarnia Rotary, which had well over 100 members, is now down to about 60 members. “Even with these numbers, this club does a lot in the community and I don’t think a lot of people realize it,” said past president Carrie McEachran. Each year, on average, the club donates about $200,000, she said. On top of $100,000 for the hospital in 2017, Sarnia Rotary is also contributing $70,000 toward capital costs at Pathways Health Centre for Children and another $54,000 toward Pathway programs. “We have a real sense of pride when we meet these commitments,” said McEachran. But fundraising alone can’t do it. Big annual fundraisers like Rotary’s TV Auction and a pancake breakfast served in Point Edward generate about $50,000. The bulk of the money is investment earnings from the Sarnia Rotary Foundation, an endowment fund started decades ago by the 89-year-old club. “We want people to know they can donate to the Foundation,” said McEachran who chairs the foundation. A portion of the Foundation’s money came from the sale of land it owned at the corner of Murphy and Michigan roads, she explained. The land was donated some time ago and is where a Shoppers Drug Mart and retirement home now stands.